Google just wrapped up its 2018 hardware event, and while we saw the company show off new products, the third-gen Chromecast was nowhere in sight. Thankfully, the streaming device showed up online shortly after along with more information about the updated hardware. First, let’s talk about the refreshed design. Just like we saw back in September when Best Buy accidentally sold the new Chromecast to a customer, the overall build of the device hasn’t changed much. Besides a matte finish and the inclusion of Google’s “G” icon, the third-gen Chromecast keeps its puck-like shape that connects to televisions using an attached HDMI cable. Unfortunately, Google decided to stick with microUSB for powering the Chromecast instead of moving over to USB-C. And next to the port, you’ll find a little button which can be used to force the streaming device to reboot in case it freezes. Thanks to the third-gen Chromecast’s Google Store listing, we did learn a bit more about the product. Starting with video streaming, the device now supports up to 1080p content at 60 fps. This spec is up from 720p in the outgoing model. The other new feature is support for multi-room audio playback. 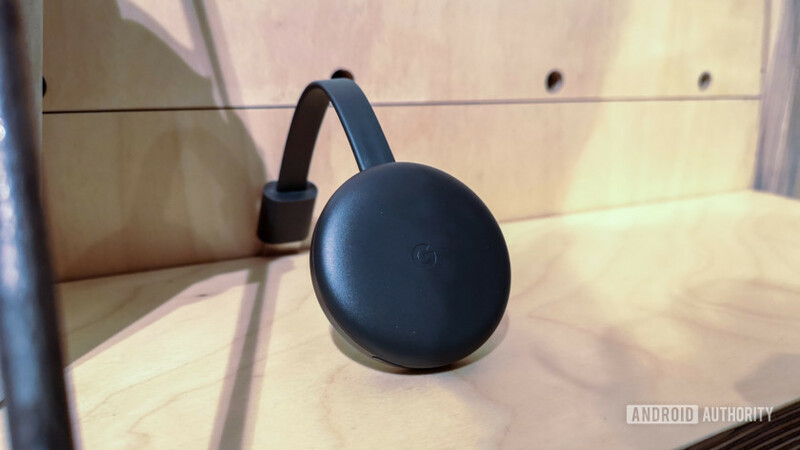 With it, you will be able to synchronize the Chromecast with other Google audio products to listen to music simultaneously throughout your home. Unfortunately, though, this feature won’t be available until later this year. If you’re interested in buying the third-gen Chromecast, you can do so by clicking on one of the buttons below. Thankfully, Google didn’t increase the device’s price, which means you can pick up the Chromecast in Chalk or Charcoal for $35. Additionally, while there’s a chance that you might find the updated hardware in a brick and mortar Best Buy, the retailer states that they’re currently only available for purchase online. If you pay extra for next day shipping, you can get the Chromecast as soon as tomorrow.